Chatsworth Truck Accident Injury Lawyer - Over 40 Years of Experience You Can Trust! Were You or a Loved One Injured in a Truck or Car Accident in Chatsworth? Our Chatsworth truck accident injury lawyers offer exceptional personal injury legal services for victims of truck collisions or the families and relatives of people killed in a truck or other fatal accidents with wrongful death claims. Our personal injury and wrongful death attorneys are known for providing compassionate legal services for victims of serious accidents and families with wrongful death claims involving truck accidents with 18-wheelers or big rigs in Chatsworth, California. A neighborhood situated in the northwest end of the San Fernando Valley in the Los Angeles metropolitan area of Southern California, Chatsworth is the home to the former Chatsworth Reservoir, the Santa Susana Field Laboratory, and many popular businesses. According to the 2000 U.S. census, around 35,073 people were residing in the 15.24-square-mile Chatsworth neighborhood, making it the smallest region in terms of population densities for both the city and the county of Los Angeles. With millions of commercial trucks driving over the national transportation network every year to move goods, truck accidents and crashes are inevitable, as people in smaller cars and motorcycles have to share the congested highways with these big vehicles. The safety of motorists is jeopardized more on freeways with their high volumes of trucks. An accident involving big rigs, semis, semi-trailer trucks, tractor trailers or 18-wheelers can result in catastrophic injury and event death. 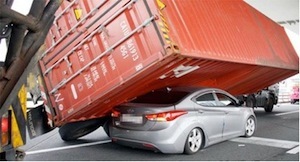 The huge weight and size of these trucks are keys reasons for the destruction caused by truck accidents. As per the California Vehicle Code, a passenger vehicle is about 4,000 lbs or less on an average, while a big rig can weigh up to 80,000 lbs. The destructive results from collisions involving such vehicles of such different sizes is obvious. According to the Insurance Institute for Highway Safety (2010), small vehicle passengers had a much higher threat of death during truck accidents as compared to the occupants of the involved trucks. In fact, 97 percent of all deaths in truck accidents involving a passenger vehicle were of the occupants of the smaller passenger vehicle. If you or your loved ones were involved in a truck crash or other personal injury claim in Chatsworth, Los Angeles, Burbank, Riverside or any other place in California, please get in touch with our truck accident injury lawyers and our legal team now for a completely FREE CONSULTATION and case evaluation. You can speak with an experienced truck accident injury lawyer or any member of our legal team on 818-222-3400 (after hours, please press 1). You can also call us on our Toll-Free number - 866 INJURY 2 or 866-465-8792 (after hours, again please press 1). You can also easily Contact Us by clicking here or by emailing us at info@WalchLaw.com! If you or a family member suffered any injury in any truck or car accident in Chatsworth, Los Angeles or anywhere in California, please contact us now. You will be glad you did! Our consultation is FREE and we work on a contingency fee which means there is NO fee until you WIN!